1249 words found; words 1 to 25 are shown. A, art. [æ] Un, uno, una Isá. A. M. (ante meridiem), [*] Antes del medio dia Bago dumating ang á las dose ng araw. Abaca, n. [abáka] Abacá Abaká. Aback, adv. [abák] Detras, en facha Sa likód, sa gawíng likod. Abacus, n. [abákœs] Abaco; tabla aritmética; el tablero que corona el capitel de una columna Bilangan ng insík; ang pinakaputong na tablá sa itaas ó dulo ng haligi. Abaft, adv. [abáft] A popa, en popa Sa gawíng likod, sa gawíng hulí. Abandon, v. [abándon] Abandonar, dejar Magpabayâ, pabayaan; iwan; hwag kumandilì; hwag kumalingâ. Abandonment, n. [abándonment] Abandono Pagpapabayâ. Abase, v. [abés] Envilecer, humillar Humamak; papagpakumbabain. Abasement, n. [abésment] Envilecimiento Pagkaabâ, pagkahamak. Abash, v. [abásh] Avergonzar Humiyâ. Abate, v. [abét] Aminorar, disminuir Magpaliit, kumulang, magbawas. Abatement, n. [abétment] Rebaja, diminución, abatimiento Pagkábabâ, bawas. Abbey, n. [ábi] Abadía, convento de monjes ó monjas Táhanan ng mga monghe ó mongha. Abbot, n. [ábæt] Abad Punò ng mga monghe, pangulong monghe. Abbreviate, v. [abríviet] Abreviar, compendiar Magpaiklî, iklián; magpadalî. Abbreviation, n. [abréviacien] Abreviación Pag-iiklî, pagpapadalî. Abdicate, v. [ábdiket] Abdicar Ibigay (sa ibá ang kaharian). Abdication, n. [abdikécion] Abdicación Pagbibigay (sa ibá ng kaharian). Abdomen, n. [abdómen] Abdomen Pusón, ibabâ ng tiyan. Abdominal, adj. [abdóminal] Abdominal Nauukol sa pusón. Abduct, v. [abdáct] Sacar por fuerza ó engaño á alguna persona Dahasín, agawin. Abduction, n. [abdáccion] El acto de sacar por fuerza ó engaño á alguna persona Pangdadahas, pag-agaw. Abeam, adv. [abím] Á lo ancho Sa kalwangan. Abed, adv. [abéd] En cama Nakáhigâ, nasa higaan. 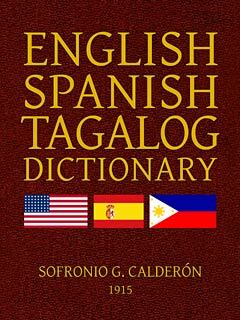 Sofronio Calderon's English-Spanish-Tagalog dictionary was first published in 1915. Because of its age, you may encounter a lot of old words and spellings that are no longer in use. Use at your own risk. The dictionary has been digitized, and a searchable interface has been added for this website. To lookup a word in a certain language, simply type it into one of the boxes. If you are not sure about the spelling of the word, you can use a question mark (?) for a single unknown letter, or a star (*) for a sequence of letters. If you cannot find a word at first, try using stars before or after it. If you find fewer words than you expect, verify you are not applying filters on more than one language at the time. The phonetic guides are intended for Spanish speakers, and thus follow the rules of Spanish orthography. Please note that this database may still contain a small number of errors. Please notify us if you encounter an error. Please do no try to harvest all words in this dictionary with a robot. If you want the entire dictionary in one file, please go to Project Gutenberg, where you can download it in a number of formats. An ePub version is also available here (1.2 MB download).